One of the reasons I love visiting California is the Vietnamese food! 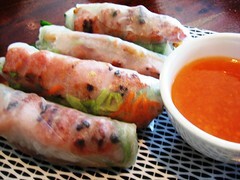 Nothing compares to it (other than home cooking and actually eating in Vietnam of course)! It seems in California, you can find anything your Vietnamese heart (and mouth) desires. 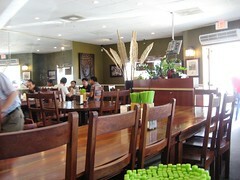 There are so many choices; any Vietnamese dish you can think of can be found here. How timely then that I get to submit this post to the new blogging event Delicious Vietnam, founded by A Food Lover's Journey and Ravenous Couple (whom I got to briefly meet!). This month, Anh of A Food Lover's Journey is hosting! 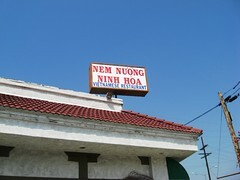 During my last few visits to California, I have always visited Nem Nướng Ninh Hòa. Obviously, I had to order the dish that is the namesake of the restaurant. My bà ngoại (maternal grandmother), aunt and cousin shared an order of nem nướng cuốn, Vietnamese rolls with pork meatballs and shrimp spring roll. The four rolls came with a sweet sauce for dipping. Although nem nướng (pork meatballs) may be their specialty, I remember this restaurant for the bánh bèo (rice flour cakes) that comes in individual dishes. Each cake is topped with ground shrimps, green onion and a crouton. You just need to ladle some fish sauce on top and enjoy! My sister and I still talk about these bánh bèo with fond memories! 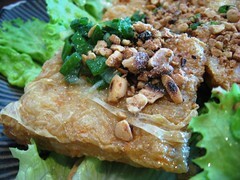 I also ordered a portion of tàu hũ ky, which comprises of ground shrimp wrapped in bean curd skin and deep fried. It came with a third dipping sauce. I really liked it but really felt quite gluttonous eating this as the first two dishes were quite sufficient. 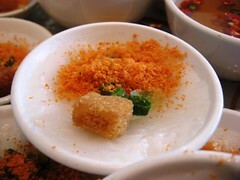 Close-up of bánh bèo and tàu hũ ky. I had my fill of food but this just the start to my week in California! Enjoying Vietnamese food is always a highlight of my trips to California and I'm lucky to have friends and family who let me indulge! 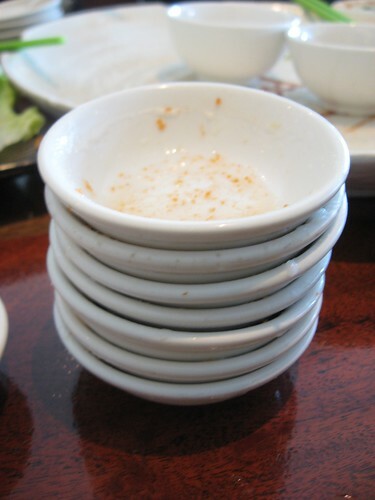 Yes, that's my stack of empty bánh bèo dishes...! banh beo is one of my favorite vietnamese food! That restaurant looks very nice! So yummy food everywhere! °_° Delicious! Have yet to visit this place and I am from CA. I do need to eat more Vietnamese food! 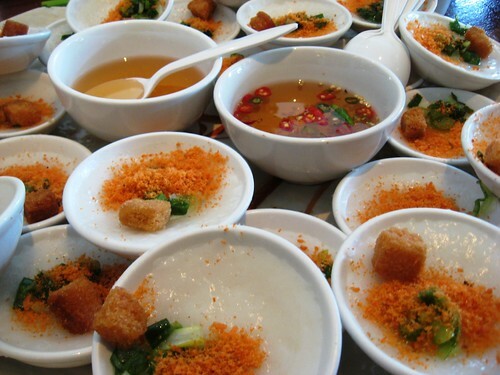 That's a lot of banh beo dishes you have there ;) Can't wait to see what you have up next on your trip. Beautiful place! 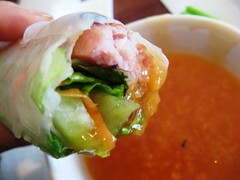 I too have a fav Viet restaurant where I can do and order fab dishes! Thanks for your entry! Great review. I'll have to try this place next time I am in the valley. Banh Beo is simple and delicious.